Supposedly Santa watches us when we are sleeping, but tonight, someone else is watching Braxton. He is having a sleep study done at the hospital. 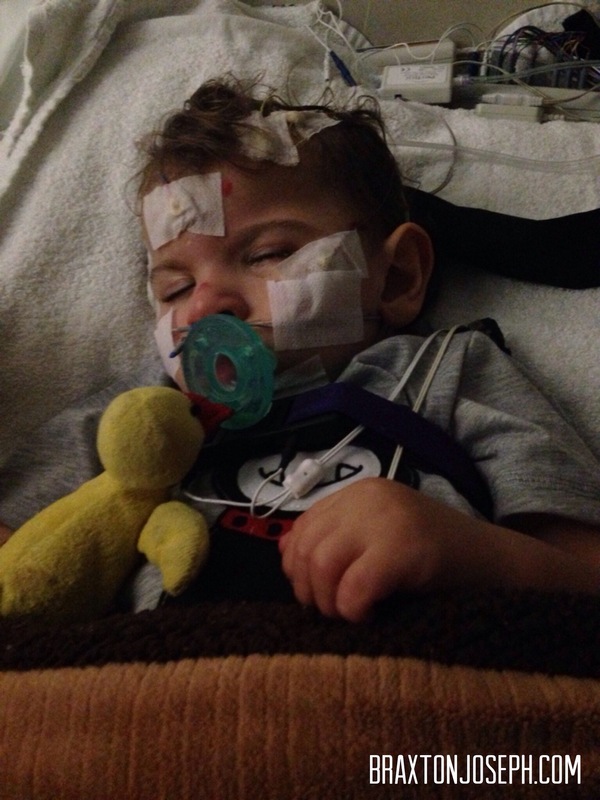 We saw a sleep doctor a couple weeks ago for a consultation to see if Braxton even needed a sleep study. Surprisingly, the doctor said he had actually worked with 4-5 children who had Rubinstein-Taybi Syndrome, so he was familiar with the sleep apnea risk these kids often have. Due to Braxton’s RTS diagnosis and the fact that his tonsils are so enlarged, the doctor said we absolutely need to have a sleep study done. Thankfully, they were able to get us scheduled before the end of the year. We checked in tonight just before 8:30 and they got us in to a room pretty quickly. I had Braxton all set in his mandatory 2-piece pajamas. Admittedly, I am still terrified about the possibility of him pulling at his g-tube in the middle of the night and me not finding out until the morning, so he still sleeps in a onesie. Gave me a good excuse to go out and buy him some new cute pj’s! 😉 Braxton was quite patient and cooperative! Luckily, I remembered to bring his iPad, and he played happily while the tech got him all set up for the study. She marked his head so she knew where to place the EEG leads. Then, she cleaned the areas. Finally, she placed the leads and glued them in place. Braxton was a total champ during the process. The iPad kept him distracted and content. Braxton really only got upset when she had to put the nasal cannula on him which monitors his breathing as he sleeps. He tugged at it a few times, and then he left it alone. Amazingly, Braxton fell asleep almost right away! I’m not sure how, but he is fast asleep. The tech is really nice and said she will be coming in periodically to check the leads and the respiratory monitor. I am somehow supposed to make myself comfy in a big chair and get some sleep tonight, but not sure that’s happening! 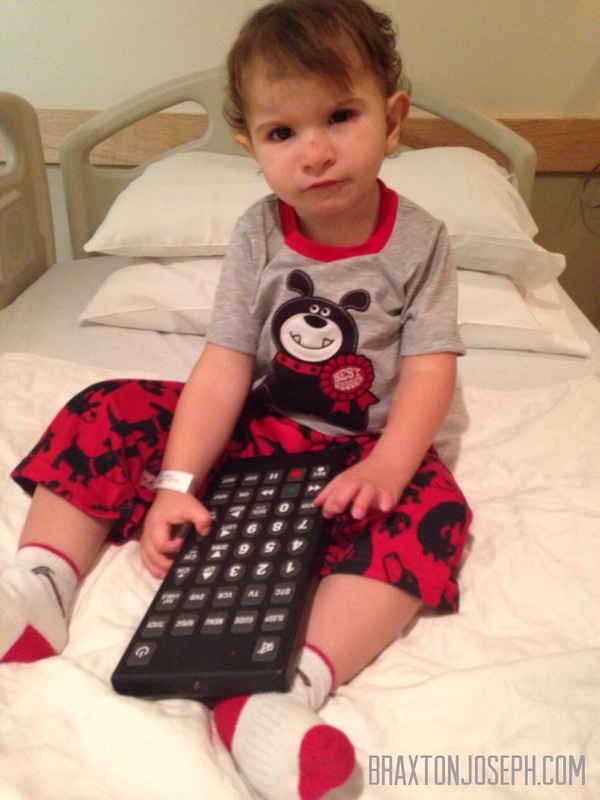 They said they usually stop the study at about 6 am and then get him all cleaned up from all the gunk in his hair. We should be on our way out of here around 7am tomorrow. We follow up with the sleep doctor in mid-January to get the results of tonight’s test. The sleep study will tell us if Braxton has sleep apnea. If he does, the doctor will need to determine how severe it is and if any intervention is necessary (like a CPAP machine). It will also give us a better idea about whether or not Braxton needs to have his tonsils removed. If he is having sleep apnea, he does not need his enlarged tonsils blocking his airway as well. Just another piece of the puzzle. Here’s to hoping I get some sleep tonight! I’m a tad jealous that Braxton can pretty much sleep anywhere, at any time, no matter the circumstances. Sleep well little cutie pie.